Losing a baby is one of the most devastating experiences for any parent to cope with and they often do not have time to collect memories to remember their child by. Communities come together in times of grief and one bereaved mother, Val Isherwood, vowed to help others after losing her baby girl. “Tigerlily Trust came about to support bereaved parents locally because there was no support of the kind I wished I’d had when I lost my baby girl. The nearest was Blackpool,” said Val, who is a Trustee. The charity, based in Grange-over-Sands, provides support to parents across South Cumbria who are dealing with the loss of a child. Run by mothers who have similar experiences, it provides remembrance boxes and miscarriage care packages to families, filled with items tailored to help overcome their grief. 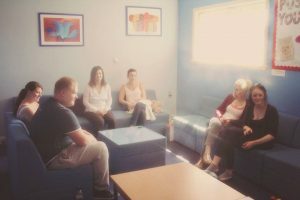 As well as a first point of contact for bereaved families while they are still in hospital, the Trust also holds regular support group meetings in Barrow and Kendal and offers one to one peer support with bereaved mothers. The group received £2,000 from the Cumbria Fund and Cumbria Grassroots Grants Fund to hold seven six-hour creative grief workshops in Kendal where more than 45 bereaved parents came together to explore creatively and find ways to express their grief and love. One mother’s baby boy was tragically stillborn on New Year’s Day. The Trust was contacted by the bereavement midwife as she was in desperate need of support. As a single mother she felt isolated and alone and due to extreme anxiety felt she couldn’t join a face to face support group. She also had an older son who was also grieving over the death of his baby brother. The Trust gradually built up a relationship with her over the phone and helped to build her confidence to go to a workshop she wanted to attend. Her aunt, who had also previously suffered a loss, brought her along and with her support helped her become less anxious about meeting new people and start tackling her grief. Val said: “Coming to the workshop has helped her start to deal with her grief and learn how to help her older son with his. She has become an active member of the group, growing in confidence and self-esteem. She also helped to hold a fundraiser to raise money for Tigerlily Trust in memory of her son, raising over £800, and boosted her confidence even further.